Any vape enthusiast will tell you that the Volcano Vaporizer is the gold standard in the vaporizer industry. Why? It is built to last, has unmatched vapor quality and offers users a healthier alternative to smoking. This desktop device gives you the control you are always wanted in a professional vaporizer. If you're tired of vaporizers burning your herbs to ash, the Volcano is the right choice for you. While it may be bigger and heavier than any other vaporizer on the market- it's vapor quality is unmatched and leaves the competition in the dust. 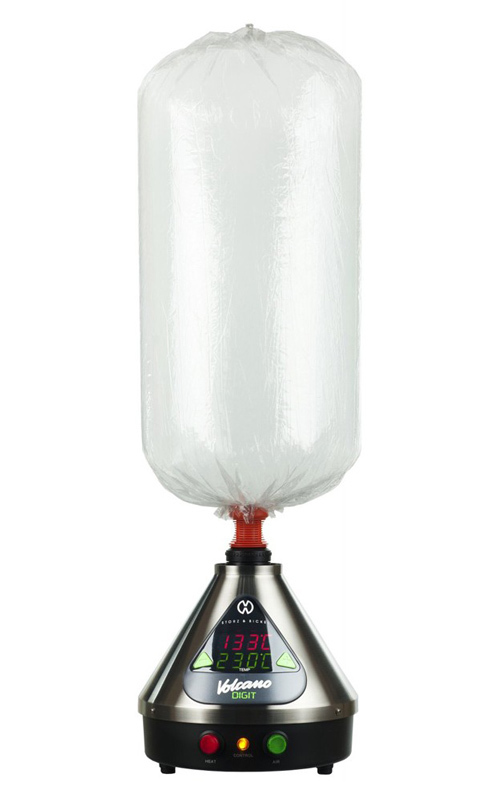 Made by Storz and Bickel, the Volcano is German-engineered and built to last the test of time. Unlike other vaporizers, the Volcano is built with heat-resistant, flavorless and food-safe materials. Designed to withstand heavy use, this is the only vaporizer to meet ISO quality manufacturing standards, and UL and NRTL requirements. It doesn't get any better than the Volcano in the quality department. The design of this vaporizer produces clean, pure and smooth vapor every time! The Volcano may have a higher price tag than other vaporizers, but it is built with top-quality materials and offers extremely accurate temperature control. Plus, each Volcano comes with a three-year manufacturer warranty. If you're a heavy user or medical patient, this is the only vaporizer you want. The makers of the Volcano say that the very first unit sold made in 2009 is still running like new. The Volcano Classic vaporizer is more affordable than the Digital version, but uses a simple rotary dial to control the temperature. Don't let this scare you away, it is still incredibly accurate. Temperature ranges with the Classic are 266-439 degrees Fahrenheit (130-226 degrees Celsius) with a temperature accuracy of about 9 degrees Fahrenheit. If price is your main focus, this might be the best balance of quality versus budget. The Volcano Digit vaporizer is a smart choice for users who are looking for extreme precision and digital temperature controls. This model weighs a bit more than the Classic, but it offers a digital temperature display and controls for the utmost in heating precision. It also features a 30-minute automatic switch off for added safety. Temperature ranges for the Digital are 104-446 degrees Fahrenheit (40-230 degrees Celsius) with an accuracy of about 2.7 degrees Fahrenheit. The quality construction of the system is impressive, but it is the vapor quality that really sets this vaporizer above the rest. Precise temperature controls and a smart delivery system makes this performance vaporizer the highest quality unit ever built. It heats herbs, spices and essential oils gently, so they never burn. The precise temperature controls are incredibly accurate, so you can choose the right setting for your material. Once things start heating up, the balloon will catch the vapors. All that is left to do is remove the balloon from the device and directly inhale. The best part? It takes less than a minute to fill the balloon. Volcano vapor is smoother, more flavorful, and more aromatic than your typical vaporizer. And you can easily control the density of the vape by grinding your material a little thicker or finer. The finer the grind, the thicker the vapor. Both the Classic and Digital units give you the option of choosing an Easy Valve or a Solid Valve. What does this mean? Let's take a closer look at each option. Balloons are not replaceable, so after heavy use, you'll have to replace them. It is also important to note that the Easy Valve and Solid Valve parts are not compatible. The Solid Valve is a great long-term choice because you can continue replacing the balloons yourself with the bulk balloon material, or you can use heat-resistant oven bags. It is truly customizable. But the Easy Valve will give you the convenience of being able to start vaping right out of the box without having to attach the balloon material yourself. The Easy Valve is just that easy to use. It comes pre-assembled and ready to use right out of the box. This is a great option for people who plan to use their vaporizer every day. The only drawback: once the valve can no longer be used, you'll have to replace it. The Solid Valve is a bit more complicated, but it allows you to customize the balloon size. Each box comes with 10ft. of balloon material, so you can make them as large or small as you want. The biggest issue with this valve type is that you have to assemble it yourself. The Volcano offers a healthier alternative to smoking and is the best vaporizer for medical marijuana patients. Thanks to the precise temperature controls, the materials never combust. This means you take in pure, flavorful vapor that is more potent and effective than traditional smoking. And because the material never reaches the combustion point, the vapor contains no noxious byproducts or carbon monoxide. And if you're using the vape for medical marijuana, the vapor produced will contain a higher concentration of THC while eliminating the harmful toxins found in traditional smoking methods.In fact, 88% of combusted smoke gases consists of non-cannabinoids. But vaporized gases consists of 95% cannabinoids. With vaporization, you get the biggest bang for your buck. Vaporizing, in general, is easier on the lungs because you're never actually inhaling smoke and the toxic by-products of smoke. With vaping, there is no smell and no smoke. Plus, you'll maximize your herbs and oils. How? Vaporizing requires less material and extracts the most out of the plant. The entire family of professional grade vaporizers from Storz & Bickel set the bar for quality and value. Should have bought one a long time ago! This thing is great! I should have bought one of these a long time ago! By far the best device I’ve ever bought! Nice clean hits, taste is amazing and doesn’t stink up the whole house. Price is kinda steep but well worth it in the long run! I am new to vaping CBD and just happened to stumble upon the Volcano. It is a great quality device. It fits on the kitchen counter like any other appliance. You don’t have to even put it away. Vaping utilizing The Volcano is a healthy experience that leaves you with a great sense of either a cerebral high or body high. It is a superb product that offers the optimal aspects of vaping. I bought the classic 14 years ago and it still works fine. I use it daily. Quality product built to last. I bought mine 6 months ago and its probably paid for itself. You save so much material vs traditional methods. I love it! #1 - Turn on the unit and let it heat up (about 3-5 minutes). #2 - Select the desired temperature. If you're using the Classic model, you'll turn the dial right or left to select the right temperature. For the Digital version, press the arrow buttons to control the temperature. #3 - Remove the cap from the filling chamber. #4 - Grind your material. Remember, the finer the grind is, the denser the vapor will be. #5 - Fill the filling chamber with your material. #6 - Screw on the chamber cap. #7 - If the control lamp is off, preheat the substance. This process takes about five seconds. #8 - Pull the balloon tight and attach to the filling chamber. #9 - Once the balloon is full, remove the entire unit (including the filling chamber). Note: Never leave the filling chamber on the vaporizer. #10 - Detach the filling chamber from the balloon. #11 - Attach the mouthpiece to the balloon. Where To Buy the Volcano Vaporizer For The Best Price? We are now able to offer you an exclusive discount where you can save up to $89 with code BESTNOW15. This is from an authorized Storz & Bickel retailer, comes with free overnight shipping and full warranty. Don't Settle For A Cheap Volcano Knockoff from eBay or Amazon. It may seem like a hefty price to pay, but the quality and durability of this vaporizer is second to none. Normally, the Classic will set you back $479, while the Digital will cost you $599. But now you can order the Classic for $407.99 (Save $72) and The Digit for $509.15 (Save $89.15) with coupon code BESTNOW15. Consider that the health benefits are proven and that the Volcano vaporization system gives you complete control over your vaping experience by allowing you to choose the precise temperature. Several portable vaporizers now come in at over $350 so in terms of performance, there is no comparison. With the balloon delivery system, you can vape separately, away from the device. Think of this as a long term investment to upgrade your experience. No other vaporizer can offer this much control and convenience in a machine that is built to withstand years of use.